TSA Boosts Number Of Security Staff, Aiming At Airport Bottlenecks : The Two-Way Homeland Security Secretary Jeh Johnson hopes that adding staff to security checkpoints will prevent longer wait times that had been projected for this summer. Faced with the prospect of long wait times at airports this summer, Homeland Security is boosting its checkpoint staffing. In this photo from December, passengers line up to go through security at the Fort Lauderdale-Hollywood International Airport. Homeland Security Secretary Jeh Johnson says he's "acutely aware" of longer wait times at airports, and now he's boosting staffing at checkpoints, hoping to avoid even longer wait times that had been projected for this summer. The move comes after officials predicted "long waits in epic lines," as NPR's Marilyn Geewax reported in March. And in a video chat today on NPR's Facebook page, Marilyn explains that airport bottlenecks are due in part to a sharp increase in the number of people traveling. 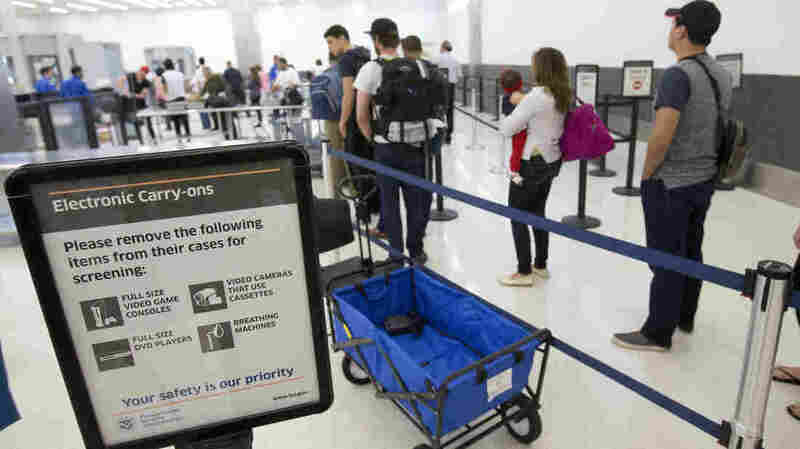 Also, she says, the TSA may have overestimated the popularity of its PreCheck program, which allows some travelers to go through security without taking time-consuming steps such as taking off their shoes and pulling items from their carry-on luggage. As Marilyn says, some travelers are reluctant to sign up for the program, because of either its cost ($85 per person for five years) or a hope that the lines won't be long enough to worry about. Johnson's strategy is to target airports that are likely to have the highest passenger volume, giving them more transportation security officers and also "increasing the number of canine teams as an additional measure to help them expedite the screening process." Johnson announced his plan Wednesday morning; along with the staffing changes, he says the TSA will work to streamline the use of bins at screening stations — and that he's asking Congress to approve funding changes that would pay for overtime and expand screening officers' work hours to cover peak travel periods. The TSA's move was quickly applauded by the U.S. Travel Association, with the industry group's president and CEO Roger Dow saying the"travel community is grateful that the well-documented problems with TSA security lane resourcing have the full attention of the Obama administration and Congress." The travel association also says it agrees with Johnson's goal of increasing the use of the TSA's PreCheck program to reduce wait times.